Backed by a rich industrial experience, we are engaged in offering a commendable array of Bimetal Contact. 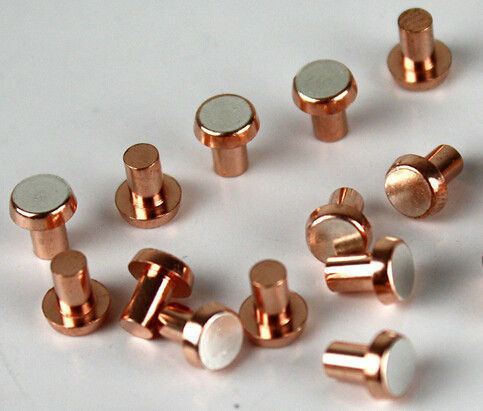 Established in the year 2005 as a Sole Proprietorship Company at Burari, Delhi, we “Shree Krishna Impex”, are renowned as the reputed manufacturer of a premium quality range of Bimetal Contact, Copper Tungsten Tips, Electrical Contact, Iron Tungsten Contact Rivets, Silver Cadmium Oxide Contacts, Silver Nickel Contacts, Solid Electrical Contact Rivets, Alloy Electrical Contact and Tri Metal Contact Rivets. Stringent quality measures are taken to ensure all our products conform to the international quality norms and standards. We offer these products in various specifications to cater to the rising requirements of clients.